21/03/18 - Lack of Clarity? How many times did you think that something "bad" was happening, only to look back on it in hindsight with a feeling of gratitude? Today's cards suggest there is something you aren't seeing clearly - either because you don't have all the details, or you aren't able to make sense of them. Deck: Mystical Shaman Oracle - see my first impressions of the deck here. Whatever you're unclear about, it's important to understand that - in the interconnected web of life - there is a lot more going on than you can perceive from your current vantage point. And that's as it should be. You are not always meant to see everything clearly or to fully understand the machinations at work. Some things can only be truly understood by experiencing them - even if you don't want to - as they become an essential part of your personal growth. In the meantime, keep an eye on your emotions and response to the things that arise. 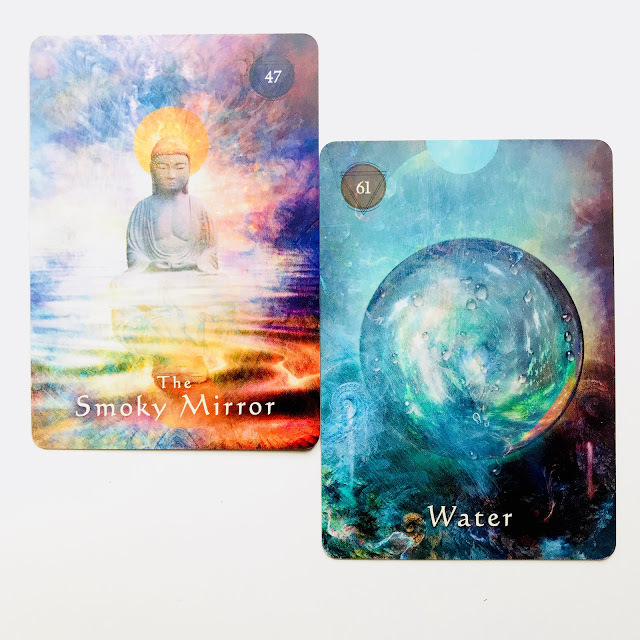 The Water card encourages you to recognise that things are constantly changing and the invitation here for you is (1) to acknowledge the 'ebb and flow' and (2) to be willing to go with it. When the smoke is meant to clear, it will.